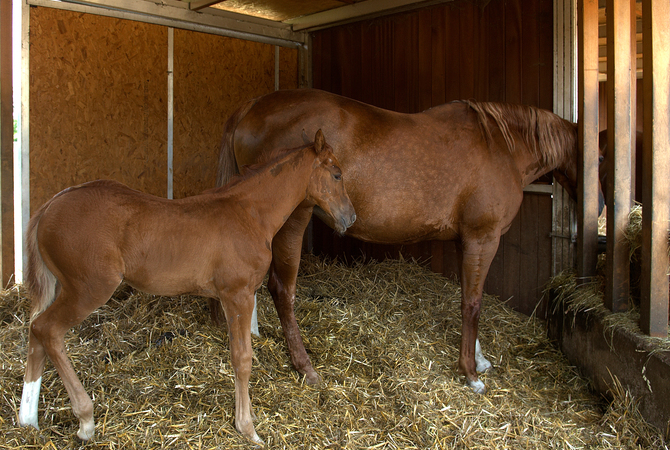 Mare and filly in stall with clean straw bedding. Depending on the material you use for your horse's bedding, managing the used bedding can be a major task or a relatively minor one. The key here is to have a schedule and stick to it. Once used bedding builds up, not only is it more difficult to manage, but it can lead to health hazards for both you and your horse. This freshly stripped stall is ready for bedding. Shavings, straw, compressed wood pellets - provide absorbency for urine and facilitate cleaning. All stalls and paddocks need to be cleaned on a daily basis. Once manure and urine-soaked bedding has been removed, wet areas should be treat with lime or another sanitizing, odor-eliminating treatment and fresh bedding should be added to insure safe, clean, dry and odor free conditions. You may want to consider the type of bedding material you use to lessen the amount of soiled bedding that must be removed daily. You don't want to reduce stall bedding at the expense of your horse's health, but you should consider the horse's needs. Horses by nature are used to sleeping on hard surfaces such as the ground. They don't need a huge cushion of shavings or straw to sleep comfortably. Rubber stall mats work very well for many horse owners. They make clean-up easier and are healthy for hooves. A stall mat offers a firm, level surface that allows you to scoop up manure and wet bedding easily. 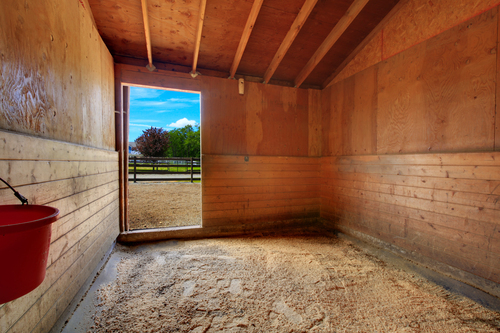 By using disposable bedding such as shavings or straw only in spots where the horse urinates frequently, you can minimize bedding use and the amount of stall waste that has to be disposed of. Maintain compost piles to convert manure and bedding into useful garden and lawn compost. One of the most productive and environmentally sound ways to dispose of used bedding is by composting. If you decide to compost your soiled bedding, you can compost manure right along with it. Choose an area that will not lead to pollution of a stream or a well and will not be offensive to neighbors. Through composting, the total mass of manure and bedding can be reduce by about one-quarter to one-half. 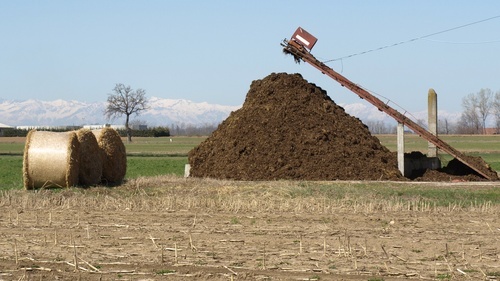 In other words, six tons of manure can be converted to 1.5 to 3 tons of finished compost which can be used in greenhouses, gardens, and nearly anywhere fertilizer would be used. If you don't choose to compost used bedding, you will need to provide temporary storage for the waste in large, covered receptacles and arrange to have it hauled off on a regular basis.